Some of these questions and other topics are covered in more detail on our Help page. How do I find an individual's ancestors? What if I want to see an individual's descendants? If I see a mistake in the information presented, can I correct it? What are the buttons for on the upper right-hand side of the page? Why can't I see all the information on a certain person? What are the benefits of Registering as a User? How do I use the Google Map displayed on the Individual Page? Q: How do I find who I am looking for? A: There are a number of ways, but the Search function provides the most straightforward method. The Search Box on the top right-hand side of the Home page provides a simple First Name and Last Name search. There is also a link for Advanced Search and in that, one to Search Families. Search Families may also be found in the Find drop-down menu. Advanced Search (also as Search at the top left-hand side of all other pages) allows you to enter information about the individual you're looking for. The Search Families offers the best way to search for a woman if you do not know her maiden (unmarried) name. All methods present you with a list of possible matches from the database. You might also want to try looking at Surnames if you don't have a clear picture of who you're looking for. You'll find these in the Home page menu and the Find drop-down menu at the top right-hand side of all pages. If you think the person is likely to be there but you can't find them, then please contact us for help. Q: How do I find an individual's ancestors? A: Once you locate an individual and have displayed the person's details, the easiest method is to press the Ancestors tab. This will show you a graphical display of both the paternal and maternal ancestors. Once you have the ancestor chart displayed, you can click on the arrows located at the far right ancestor if you need to see additional ancestors. There are a number of formats for you to choose from (Standard, Compact, Box, Text, Ahnentafel and Media) to display ancestors. Try clicking on the various options and see which one works best for you. Q: What if I want to see an individual's descendants? A: The tab marked Descendants can be used to display the descendants of an individual. There are four different formats in which descendants can be displayed: Standard, Compact, Text and Register. You can switch between these to display the information the way that works best for you. Q: Is there a way to tell if two individuals are related? A: Yes, the Relationship tab will show a graphic display of all the people between two relatives. To use this function, locate the first individual and then press the Relationship tab. Then use the find button to locate the second person to be displayed. Once you have the two people selected, click the Calculate button to display their relationship. Q: If I see a mistake in the information presented, can I correct it? A: The Suggest tab allows you to send corrections, updates, comments or any other information to the database administrator. Information on which individual you are referencing is automatically attached to the message when you make a suggestion using the Suggest tab. The database administrator will evaluate your suggestion and add it to the database in the next web update cycle if appropriate. Q: Is there a way to print the display without all the headers and icons? A: Yes, just click on the Print link located on the right-hand side of pages just below the control bar. A format that is simplified for printing is presented and you can use the print function of your browser to print the page. NOTE: On the Individual, Ancestors and Descendants pages you have the option to create a report in PDF format for the information you are viewing. To make use of this option you will need to have installed Adobe Reader in order to view the report. If you don't already have it, you can download the (free) Adobe Reader software by clicking this link. Q: What are the buttons for on the upper right-hand side of the page? A: These provide menus that let you access various categories of information contained in the database. You can hover your mouse pointer over each to see the options available. Click on the one you want. Note that some options are only available to registered users. Q: Why can't I see all the information on a certain person? A: We take great pains to protect the privacy of all family members. Dates, locations and other details of events related to living individuals are hidden. Registered users can have access to this information. If you are a direct descendant or relative of people listed on this website, please take a moment to register by clicking on Register for a User Account on the Home page. You will be asked to provide evidence of your relationship. When accepted, you will be able to view all records of your ancestor's descendants contained in the database. Q: What are the benefits of Registering as a User? A: To see the details of living descendants of your ancestor(s) and their records, documents, photographs and biographies, you must Register for a User Account, and Login when registration is approved. Registration also ensures that the Webmaster can email you with any major changes to the site. Q: What if I forget my username and/or password? A: If you can't remember your username then, via the Login page, enter the email address you supplied when you registered and we will send you your username. However, for security purposes we do not have access to your password. So, if you forget it, you can ask the system, again via the Login page, to issue you with a temporary one. Just enter the email address you supplied when you registered as well as your username. Q: How do I use the Google Map displayed on the Individual Page? Click the Event Number pin on the map to get the description, date and location of the event. Click on the Event Number pin to get directions to or from this location. Clicking on “Click to get directions” will open the map in a new window. If you are using FireFox, you can right click and open in a new tab rather than a new window. On the map in the separate window, you can get the directions. Click on the Google Earth icon to view using the Google Earth desktop application once you have downloaded and installed the application on your desktop. Use the + (plus) to zoom in on the map and the - (minus) to zoom out. If the Google Map server returns a message that no map is available at that zoom level, then you must zoom out in order to get the map to display. You can also click the Satellite button to view the map as a satellite picture with names. Q: Cousins - what's it all about? A:The dictionary is quite clear on its definition of a cousin. I think that most of us are clear on who our first cousins are. In simple terms, they are the son or daughter of an uncle or aunt. In other words, if a cousin (aka first cousin) shares a grandparent with another person, then the two persons are cousins. A child of one's parent's first cousin. It sounds like this is getting complicated so let's try and simplify it. Second cousins are related through common great-grandparents. So, two people who aren't siblings but who both share the same great-grandparents, are second cousins. The more you think about and apply the concept, the clearer it will become. A child of one's parent's second cousin. We can also simplify this term. Third cousins are related through common great-great-grandparents. 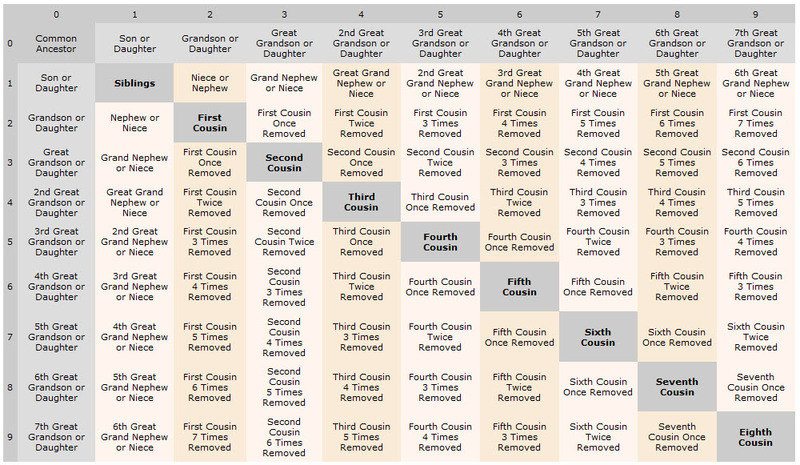 In this case, two people who aren't siblings but both share the same great-great-grandparents, are third cousins. And so it goes on; fourth cousins share the same great (x3) grandparents, etc. Once removed, twice removed, etc., are used to indicate that the cousins are not the same number of generations from the common ancestor. If the common ancestor is a grandparent of one cousin, but the great-grandparent of the other, then there is a one-generation difference and the two people are 1st cousins once removed. Blood relationships are determined by computing the shared ancestry of two individuals. Typically, people express such relationships using terms that reflect the most direct relationship. That is determined by counting the generations from each individual to the closest common ancestor; siblings share a parent, first cousins share a grandparent, etc. Here's how to calculate the relationship. The closest common ancestor is the Grandparent of the Subject (two generations) who is also the great-grandparent of the Cousin's Child (three generations). When the number of generations to the common ancestor is not the same for both the subject and the relative, the first part of the relationship term is determined by the lesser of the two distances to the common ancestor. In this case, that is two, and so the first part of the relationship is First Cousin. The second part of the relationship term is determined by the difference between the two distances to the common ancestor. In this case, that is one (three minus two), and so the relationship term is First Cousin, Once Removed. After reading the above, one might be tempted to call a niece or nephew a "sibling once removed", but I don't recommend it! Please note that a descendant of your first cousin can never be a second cousin to you. The number of times removed increases with each generation. As shown below, a second cousin is related through one of your great grandparents. The chart below shows an interesting characteristic of relationship terms. Most of the terms for near relations are not reciprocal: mothers and fathers have daughters and sons, aunts and uncles have nieces and nephews. The most common reciprocal term is cousin: cousins have cousins. Note that 1st Cousin Once Removed appears twice in the chart. The child of your 1st cousin and the child of your great aunt or uncle are both your first cousin once removed. Note that the number of generations' difference is the same. The relationship from a child of your great-aunt or great-uncle to you is the same as the relationship from you to a child of your 1st cousin. You can use the chart below to calculate the relationship between two people. Count the generations between the common ancestor and person 1. Use that number to find the proper column. Then count the generations between the common ancestor and person 2. Use that number to find the proper row. The relationship is shown at the intersection of the column and row.